Many of you will know this, Self-Care is so important to my life. I live with a chronic illness called Endometriosis. 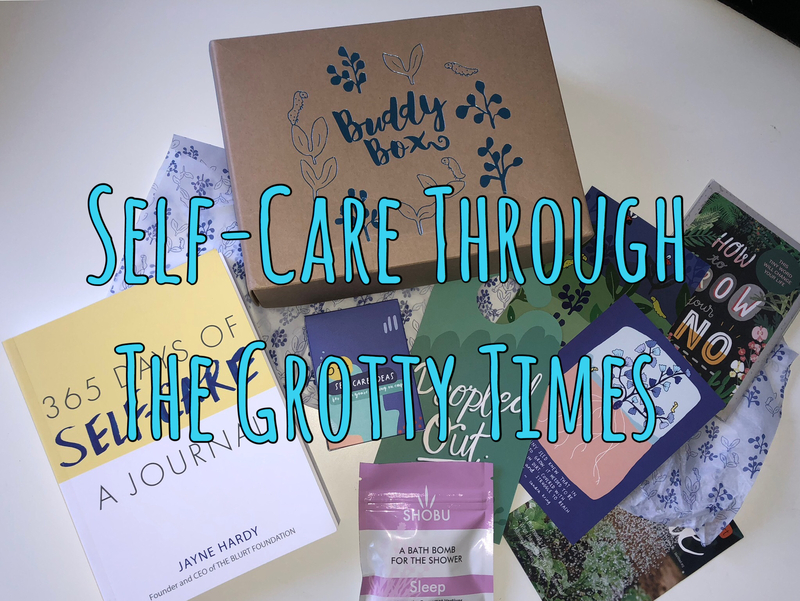 When I found out about Blurt It Out and their monthly buddy boxes, it was something I had to try out. This is my second buddy box now and I will have to say I love the box. Most subscription boxes I have got or still get are around £10 each. This box is £21.50 per month but you can also buy as a one off box which is a great idea to do and also gift to someone. They state the buddy box to be a hug in a box and I totally understand that now. Their boxes make me smile, full with full size random products and fun exciting new things to try. I would also say you definitely get more than your money’s worth in this box and not many boxes have full size products for all the products in the box. 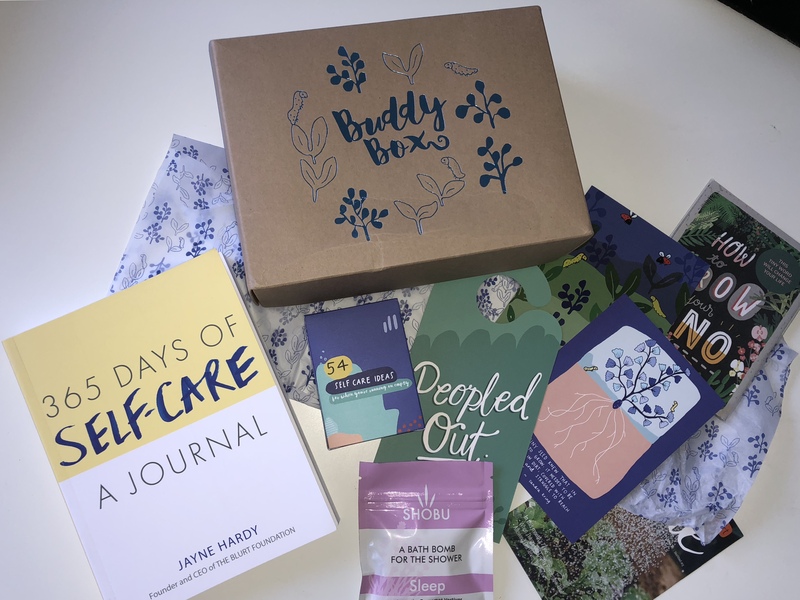 This month’s box is all about self-care. As per the title of the box, ‘Self Care Through The Grotty Times’. If you are reading this but you don’t have a chronic illness or mental health. Self-Care is for absolutely anyone. Self-care is really important to practice daily. Let’s start opening this box then. 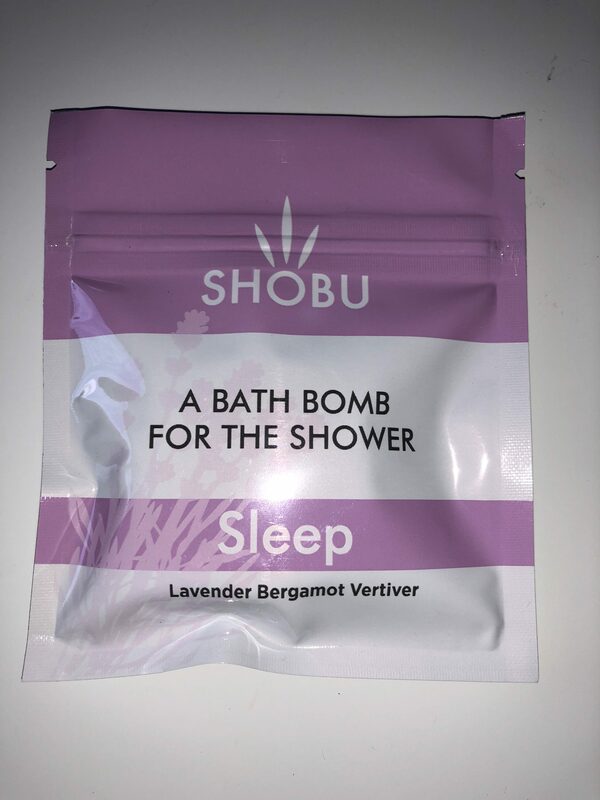 So the first thing I have picked out is the Shobu Shower Bomb in Sleep, lavender, bergamot and vetiver. Sleep is really important to me and I am one for essential oils anyway. I am also getting into pampering more and trying new products such as smellies and face masks. I have never really seen a bath bomb for the shower so this is exciting in its self but I know the scents in it are really calming and relaxing so will definitely help you to sleep or should do anyway. 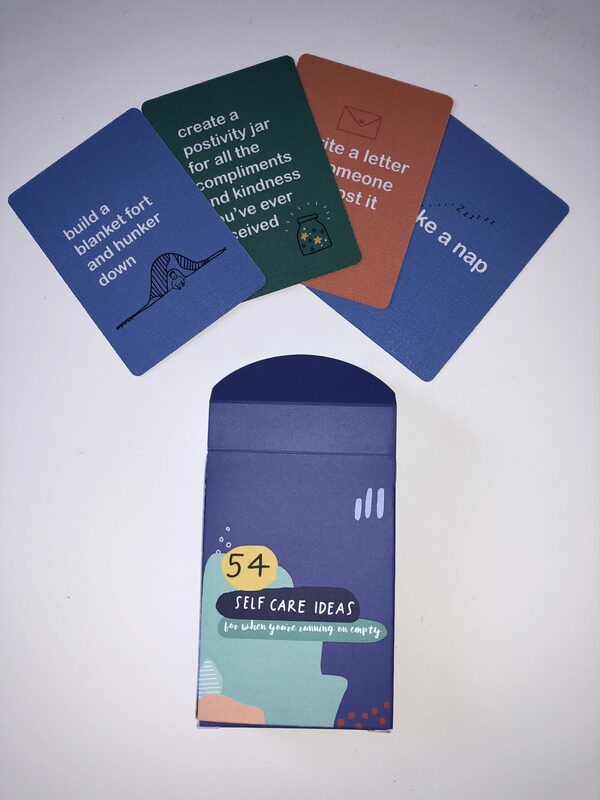 The next thing to pull out is the 54 Self-Care Ideas pack of cards. I love this. Especially for those who are new to self care or who are struggling a little more in life. They are going to give you ideas to practice and create a better life. I’ve looked through the pack and there are some really random like water the plants, but just do it. One a day and see if it makes a change or not. They are really helpful and there will be a day where you just want to take a nap or need some more tender loving care. I think I may blog a bit more on this pack of cards so watch this space. 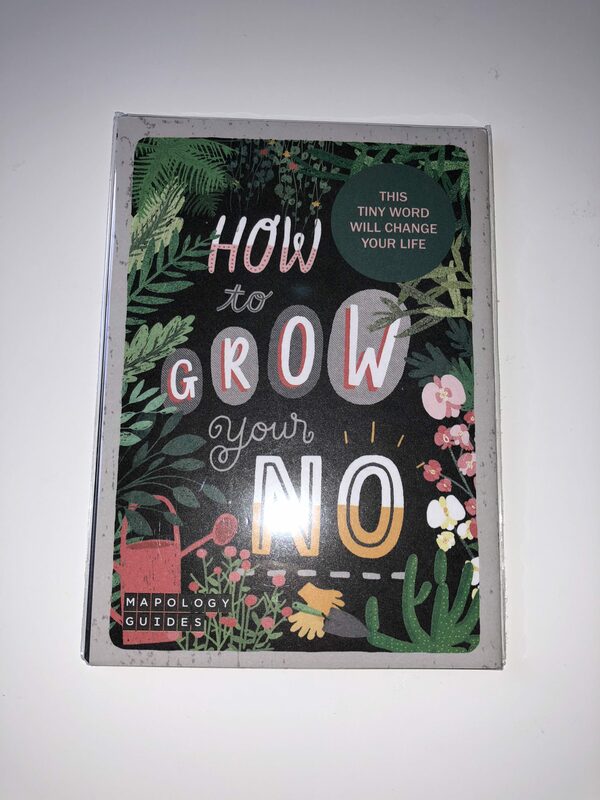 The next I have picked is the ‘How To Grow Your No’ mapology guide. Who says yes more than they say no? Even if they want to say no but aren’t confident enough to. I can hold my hands up to this and I have a lot to learn from this poster. Its double sided and has the image of a green house on it. With all the tips and tricks around and on the back of the guide. If you are confident enough to say no to people please let me know a good tip to help me. 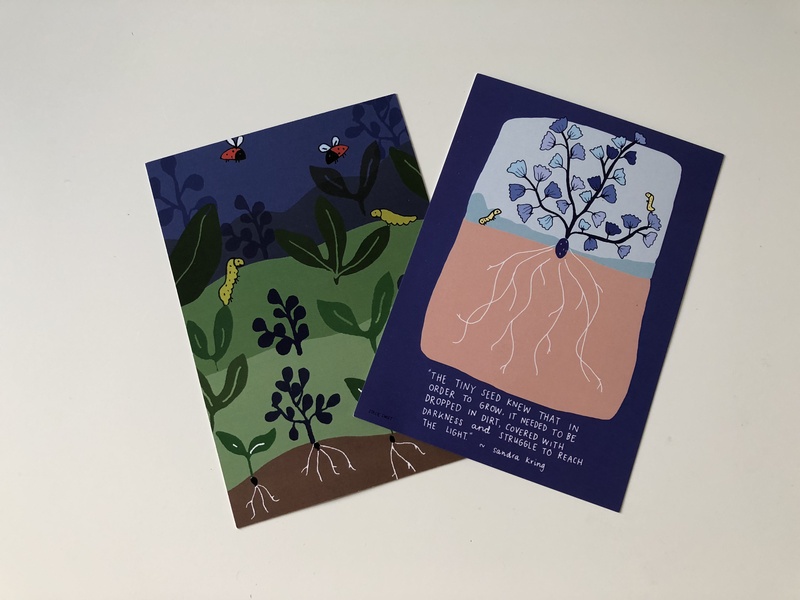 The next I have are two postcards one with what’s in the box and pricing with an image of the countryside and bugs and the second Is of a plant growing with the best quote on it. And it’s totally true we all have hard times in our life. Bad days, weeks or months even. It’s completely normal. 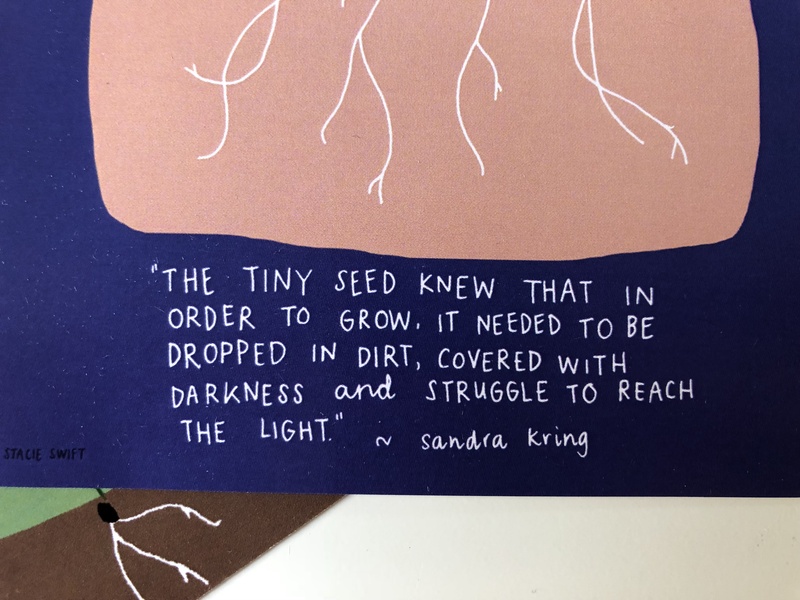 The image of the plant growing is the image on the website to match the box. The next made me laugh when I got it out the box but I can totally understand people using this. When you need to be alone then you need to be alone. 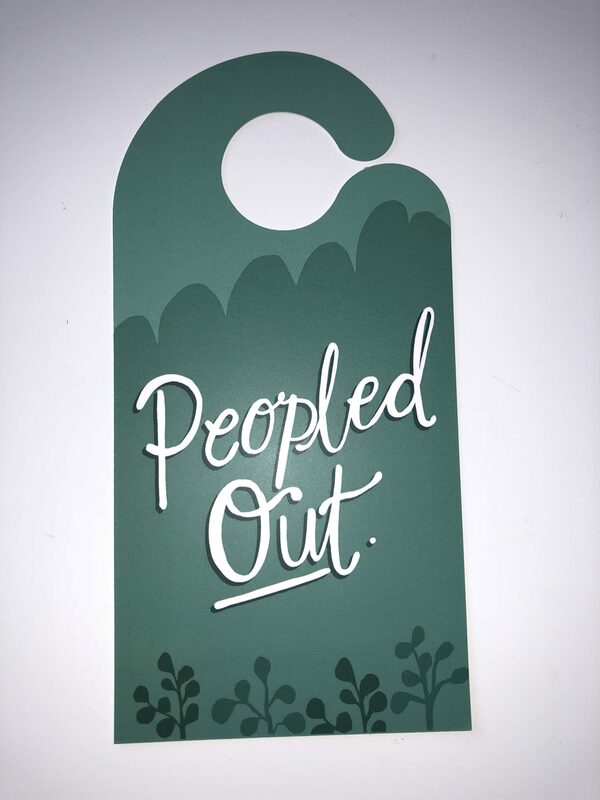 This door hanger in green with white writing stating ‘ Peopled Out’ it makes the point obvious. On the back it says ‘enter if you have’ and 3 blank spaces for you to fill in. What would you put? I would put heat, chocolate or something yummy and support. When I am having a bad time it’s all I need really love and support. Every box includes their leaflet called Zine. 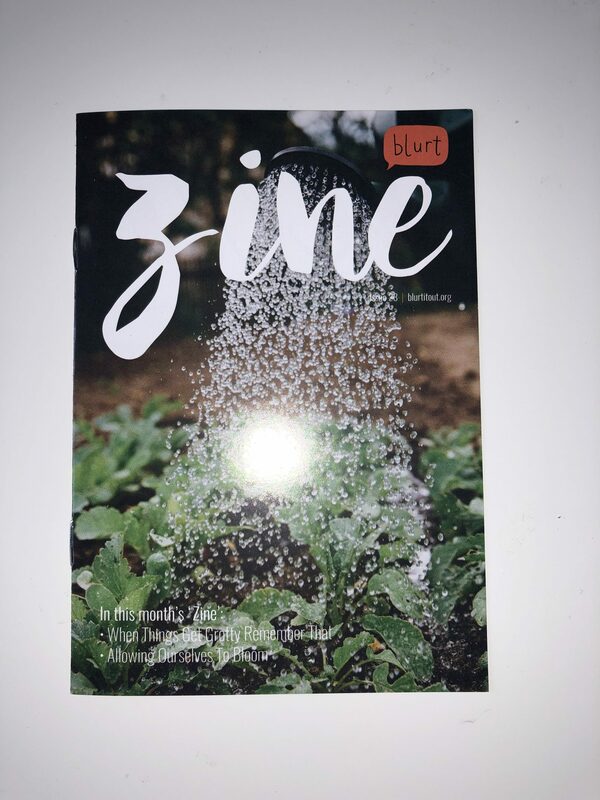 Zine goes through self-care this month and how to help yourself. I work so hard to improve and better myself but things like this really help me. Gives me that gentle reminder that I could do this or that and possibly feel better. 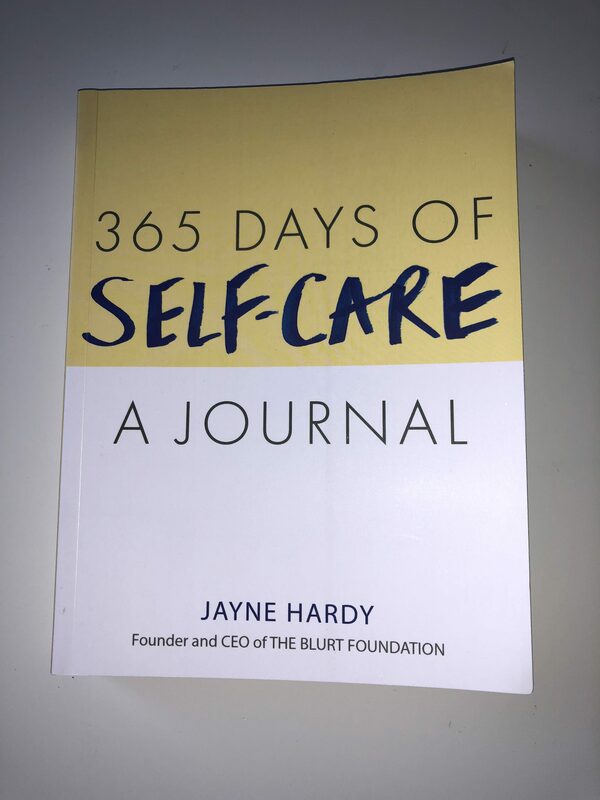 The last thing I have received in this box is Blurt It Out’s new book called ‘365 Days Of Self-Care A Journal’. I read their book ‘ The Self-Care Project’ and loved it. I refer back to it all the time so I am really excited to start using this. By the quick look it seems you set goals each month and they will ask you different things each day to achieve or do to improve and help you using Self-Care. That is all I received this month. Do you use Self-Care? What is your favourite product I received in this box? Would you buy this for yourself or friend/family member? I think I would love to send but also receive this as a gift, an unexpected one. Husband has PTSD and we have similar doorknob hangers, letting us know what he needs from us. It really does help. Self Care really does help me too. 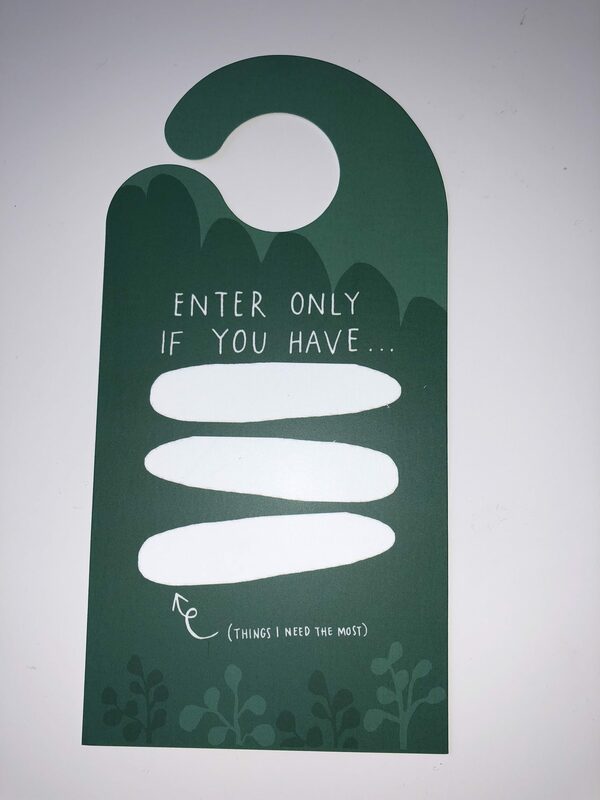 I think the door hanger is really good especially if you live with others. What an awesome post, self-care is so important! I suffer from chronic pain, depression, and anxiety!!! Wishing you well! Thank you. It totally is. I wish you well too. Oh the Buddy Box sounds amazing! It’s serioudly overflowing with goodness. I love all of the self care options in here. Thanks for sharing ♡. Thank you. I know I love it. Its totally worth the money as well for full sizes. Thank you, I love it. Its definitely worth the money for the full sizes. Self care is so important, this is a super cute idea to send to a friend having a rough time I love it ! What a lovely subscription box! I’ve never heard of it, but it seems amazing! Oh my god this is such a cool box and so helpful too … I love the cards then I was mind blown with all the other elements like the zine, poster and door hanger. thank you! Its a lovely box to receive.